If you plan on going to any of the Six Flags Parks more than once you will want this Special SixFlags deal. 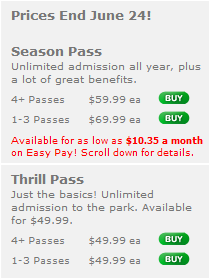 You can chose to purchase The Thrill Pass, but you won't get free access to the other Six Flags Parks. If you plan on going to more than one Six Flags location, or wish to bring friends for free on occasion, then the Season Pass is for you. But hurry up, this deal ends June 24th. Also, when using your Discover Card you will get 5% Cashback. Or, you can use BizReveal.com (I have never used them) at 4.5%, or Bigcrumbs.com for 3.5% Cashback. See below, for this special price prior to the Cashback. You can also purchase Season Parking, which is $60.00 tax included, but it is only valid at Six Flags Great Adventure/Hurricane Harbor. 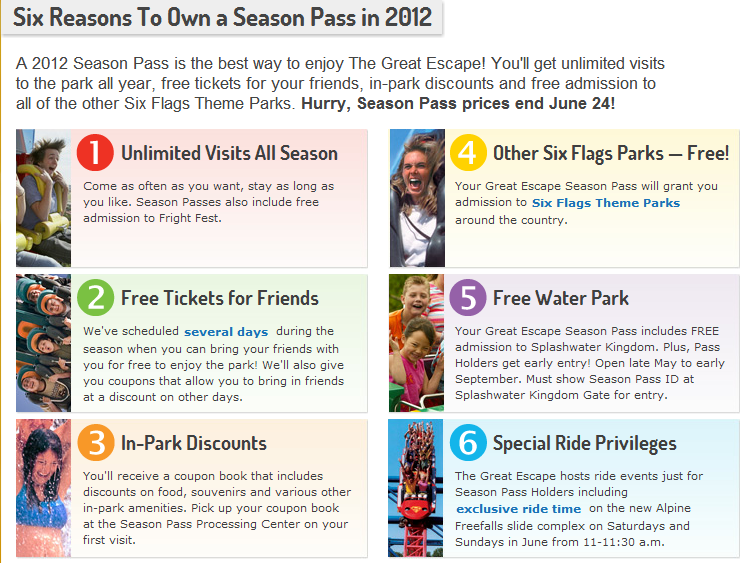 Now, why would I want a SixFlags Season Pass? Where are the differen't SixFlags that I could enter for free with my SixFlags Season Pass? 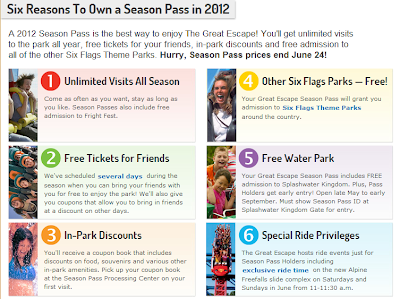 I am thinking of taking advantage of this deal because I will be close to Six Flags Great Adventure in New Jersey. I am also thinking of taking them to Lake George to take advantage of the free entrance to The Great Escape. Will you purchase this deal? Are you going to go to more than one SixFlags? Hat tip to My Dallas Mommy !